The TLP38xx series offers the same reliability as the printers of the 28xx series, though they are more powerful in some respects. The TLP 3842 features a high-resolution of 300 dpi, making it especially suitable for working with finer graphics, small texts or labels with a particularly clear printface. 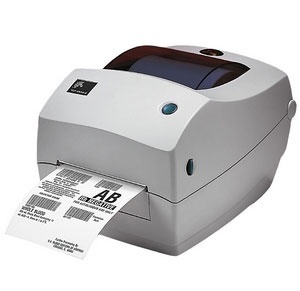 It prints labels by means of the particularly durable thermal transfer process and requires a thermal transfer ribbon for this purpose. The sophisticated paper and colour ribbon duct of the Zebra desktop printer makes handling the printer easy, even for laymen no complicated threading and no torn ribbons. The compact plastic casing always contains a threefold interface, so that you can control the same machine optionally with a parallel, serial, or even USB interface. The corresponding power supply is included in the delivery package.